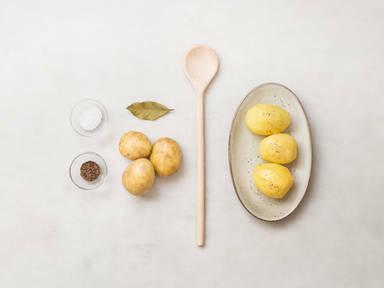 Peel potatoes with a vegetable peeler or small knife, halving large ones. Add to a large stock pot with salt, cumin, bay leaves. Bring water to a boil over medium-high heat, cover, and cook for approx. 20 – 30 min. Drain potatoes and transfer to a plate. If you can easily insert a knife into the center of the potatoes, they are finished. Top off with a few pats of butter, salt, and pepper.